& $25 free after your first deposit! Sprint for Cash – opt in and play at any cash or speed table and all your points you earn will count towards your position in the weekly leaderboard where you can win your share of $16,000 monthly. Also, by participating in the Sprint for Cash you get an extra boost of 10% of your points earned each day – that adds up to 70% when you play all week! We have an exclusive bonus for all of our players who use the bonus code VIPTITAN when they sign up and deposit for the first time. This really is a massive bonus with lots of extras so check out our page for full bonus code details. 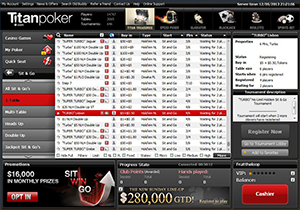 Part of the iPoker network, Titan Poker first appeared online in 2005 and has become one of the major online poker rooms. 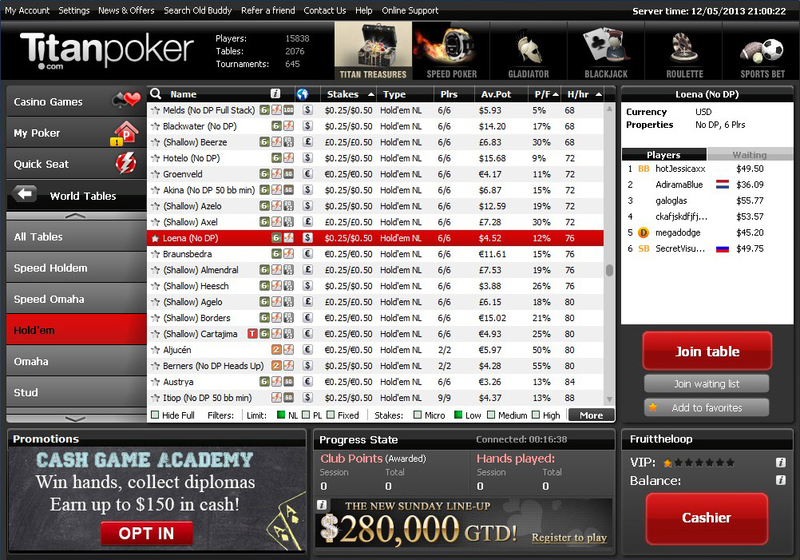 iPoker recently graded their poker rooms into two tiers. 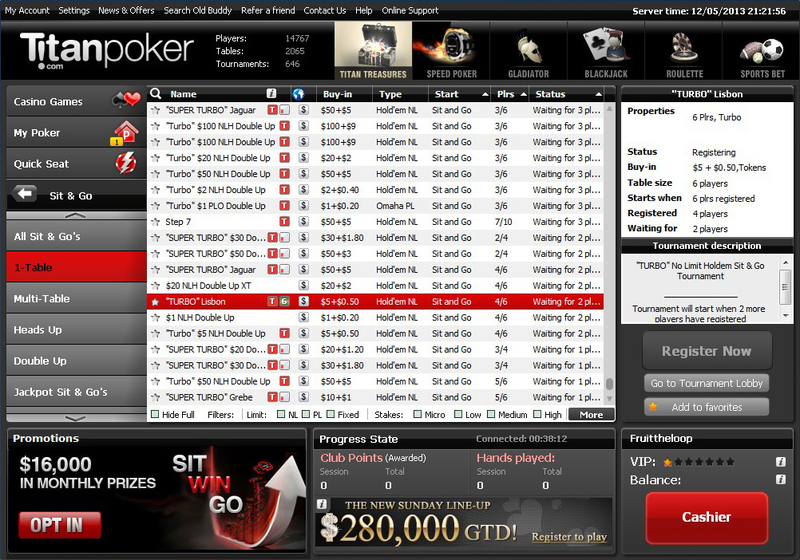 Titan Poker is in the top tier comprising of the more successful sites and has a larger range of games only available exclusively to players within the iPoker 2 network. When you first sign-up a live operator will take you step by step through the process, sorting out any problems on the way. The live operators are always available for any questions you may have, they seem knowledgeable and efficient, making Titan great for a beginner who may not know their way around an online poker room. Titan Poker takes it’s promotions very seriously and there’s always something new going on. The VIP Club, where the more you points you accumulate the greater weekly cashback you can claim, offers exclusive freerolls for their loyal players. Titan definitely makes you feel wanted. Titan Poker are very good at letting players know when a reload bonus is available so check your email regularly for any specials on offer. If you are thinking of reloading then check out the live support and ask if any deals are currently available – sometimes you can get a great deal through this route. You need never miss another tournament with the newly launched free iPhone app! 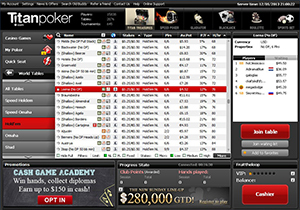 The free to download Titan Poker Planner provides full tournament details for the next 24 hours, or you can filter the schedule based on buy in or game type. Easily downloaded directly from the App Store or visit the website and scan the barcode, simple! A shame you can’t actually play on your iPhone, but hey, at least they’re making an effort. Options: Beginners, Standard, Turbo, Fastfold. Overwhelming focused on Texas Holdem (these tables get a decent amount of traffic around the clock) other games like Omaha and Stud are offered. $250 Bad Beat Bonus – Fancy playing a cash game with a little extra interest? Get beaten by quads kings or better at any Texas Holdem cash game and you can claim your $250. 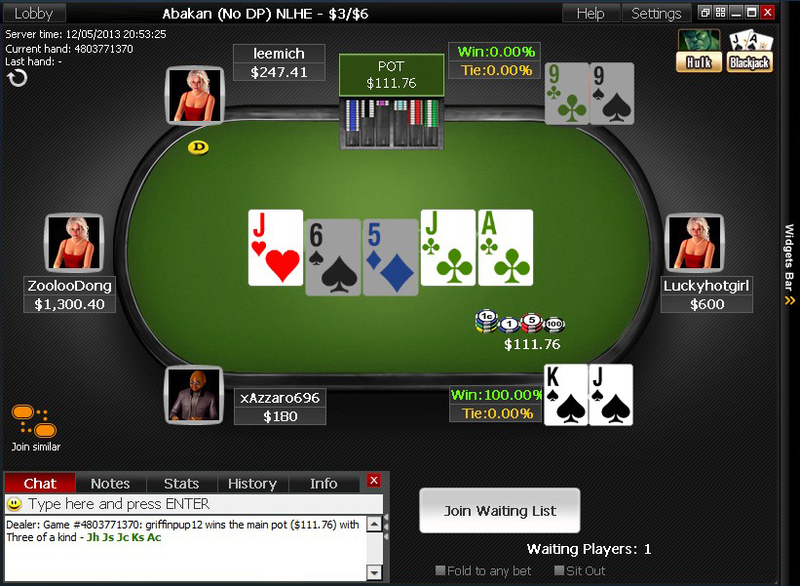 Speed Holdem is their version of fastfold poker – the super fast poker where you are in on the action the whole time. When you join a table you enter a huge player pool where you’ll be playing different players with each and every hand, use the speed fold button at any time and you’ll be instantly seated at a new table with a new hand. You can always find a tourney to suit your budget, with plenty of guaranteed prizepools with a balanced mixture of freezeouts and R&A (rebuy & add-on). Again Texas Holdem is the main game with only a few of the other game variations. Looking for a big guaranteed money tournaments? Then look no further than the Sunday $200k guaranteed kicking off at 6pm UK (1pm New York time), you can buy in directly for $215, or enter a satellite from as little as $0.11. There’s also a Friday $50k guaranteed (rebuy and addon) at 8pm UK (3pm New York time), the blinds increase every 12 minutes and unlimited rebuys for the first hour of play. You can enter directly for $109 or enter by satellite for as little as $1.60. Every Saturday at 7.30pm (2.30pm New York time) you can join the $30k Guaranteed Freezeout with starting stack of 5000 chips with blinds increasing every 15 minutes. Enter directly for $109 or via a satellite from $8.80. Earn 750 VIP points during the month. 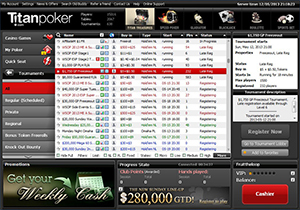 10k Bonanza VIP Satellite – open to all VIP2 and above players. Options: Beginners, Short stack, Double Stack, Turbo, Super Turbo and Jackpot. Games: Texas Holdem, Omaha, 7 Stud, Razz. Jackpot Sit n Go’s – There’s a range of progressive jackpots where the prizes can grow into big bucks. A very good loyalty programme (VIP Club) where you can exchange your Titan Points for cash with the new Weekly Cashback incentive, to enter special tournaments and purchase merchandise. With the Titan VIP Club you will be building up your points with every hand you play. 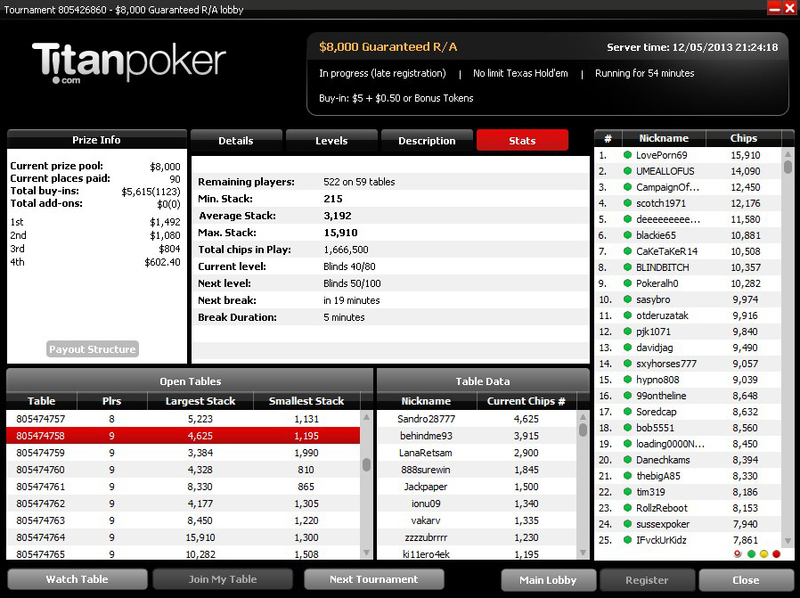 Cash games attract points at a rate of 15 VIP points for every $1 contributed to the rake. Tournament players build their points up at a rate of 17 points per $1 collected in tournament fees. As you generate points you’ll qualify for a VIP level, the higher the level the greater the benefits. As you climb through the VIP levels a multiplier will kick in to make your points grow at an even faster rate. Exclusive to Titan Poker players is The Grand Battle which runs on a monthly basis with cash prizes to be won. These are simple points races where the more you play the greater your chance of rewards. You can compete in weekly races plus one monthly race. All you have to do is remember to opt in on the website or on the software. Cash outs usually completed within 48 hours. Email, freephone and live support. Very quick response, with relevant answers. Titan Poker last reviewed by DirectoryOnlinePoker.com April 2019. All rights reserved.